Brite-Mark makes clear, bold markings on almost any surface. It has a quick drying, oil-based paint that withstands harsh outdoor conditions without fading, chipping or losing its opacity. Brite-Mark is ideal to mark inventory, assemblies, tools and finished products. It leaves clean, bright marks on metal, rubber, plastic, glass, concrete, leather, stone, wood and vinyl. Brite-Mark features a patented valve action mechanism to prevent the marker from drying out even if the cap is left off. The pen has replaceable nibs so all paint can be used and the heavy duty aluminium body of the Brite-Mark will outlast harsh industrial environments. 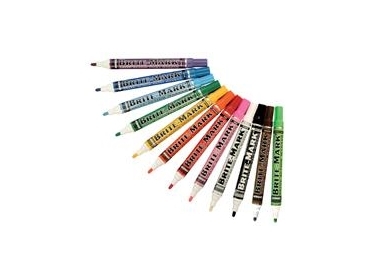 Australian Warehouse Solutions (AWS) are the exclusive stockists of Brite-Mark pens.